Watch the sun rise and set from this stunning hill top location with panoramic views of the ocean, mountains, vineyards and orchards. This 2 bedroom cottage is in a quiet rural setting and sleeps 6 just a short drive from historic Nelson city. Comfy king size bed in master bedroom, two twin singles in second bedroom plus quality queen size sofa bed in lounge. It is private and self contained with friendly hosts on hand to help with local knowledge if needed. Enjoy the beautiful swimming pool at any time, stunning views of the stars at night, read your book in a relaxing lounger. 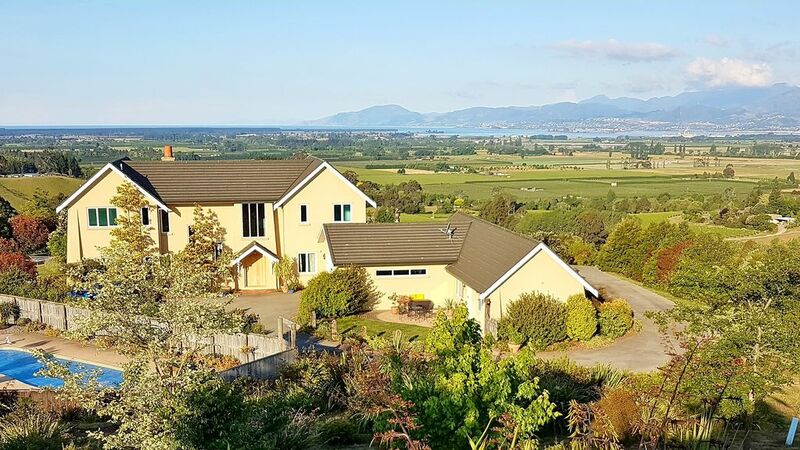 Garden and patio and multiple seating areas for sun and shade and unbeatable views of Tasman Bay and beyond. Just minutes away is Rabbit Island with miles of golden beach, BBQ and shaded picnic areas. Mountain walks, river swims, wine tasting and the Great Taste Bike Trail are all on the doorstep. Three of the South Island’s iconic National Parks are within a day trip; take a boat trip on the pristine waters at Abel Tasman, or an alpine walk at Nelson Lakes or an adventure in untamed Kahurangi. In SUMMER, sip wine by the pool and take in the views. In WINTER drive to Rainbow Ski Resort for a day on the slopes, then come back to a warm heated house. MODERN, BRIGHT and SPACIOUS and fully equipped with quality appliances. Cottage will be thoroughly cleaned before and after your visit so you can concentrate on relaxing! Easy wheelchair access and wheelchair friendly interior. Plenty of parking space even for boat or horse float. 2 pet dogs and on the property and cattle and sheep, alpacas in surrounding paddocks. 4 night minimum over Christmas and New Year. Smoking allowed outside patio areas only. After years of travel before kids and years of self catering holidays with kids, we think we know what makes for a great, stress free and fun holiday. All ages welcome and of course adults too! We love our place and aim to make your stay with us one of your best holiday memories. It's a real privilege to meet so many different people from New Zealand and overseas. We take our cue from you - just a quick hello or chatting for hours over a glass of wine! Come and enjoy a slice of paradise in the sunniest spot in New Zealand.We fell in love with the view and you will too! Everybody says you can't take a photo to do it justice - we know, we've been trying for years! We designed and built our dream home and feel very lucky to be here. We offer all the freedom, space and privacy of your own place with the added benefit of somebody available should you need help or advice with anything to make your holiday run smoothly. We want you to get the most out of your time with us. We are in a perfect location to easily visit the region's many attractions just 25 mins from Nelson city in one direction and 45 mins to Abel Tasman National Park in the other. Just 10mins drive to beautiful pristine natural beach at Rabbit Island or 25 mins to Nelson's city beach Tahunanui with restaurants and cafes and childrens entertainment. The Richmond ranges are spread out in all their glorious blues and purples. Excellent Mobile coverage throughout property and grounds. Landline available in main house if needed. Rack airer in cottage, outside clothes line plus dryer in main house if needed. large family size fridge with freezer section. Well equipped Kitchen with quality dishwasher and washing machine, large family size fridge with freezer section. Plenty of cutlery, crockery, glasses, cookware and pots and plastic for kids. Wheelchair friendly but does not have grab rails. Please contact for more details. Smoking at outside patio areas only. Beautiful pool available at all times, magical at night with fairy solar and night lights. Loungers and tables and chairs in pool area. Safe grab rail all around edge of pool, shallow end. this is a great location, wonderful views and hosts and in the country but so close to everything. Lovely clean cosy home with the use of a great swimming pool. The property had everything we needed. It was in a beautiful location, very peaceful - up on a hilltop with great views down to Nelson Bay. Lovely outdoor seating/ eating area which took advantage of the view. Very comfortable bed and very quiet location. Perfect for a relaxing weekend break to get some fresh country air. The kitchen was well equipped. The owners were pleasant and helpful. Like home from home, good size for 2 adults and 2 kids, great quality bedding, linen and facilities- added bonus of a dishwasher. Seating on both sides meant breakfast and dinner in the sun. Would definitely recommend as a great location to reach Golden Bay as well as Nelson. Thank you. Glad you had a relaxing break and we hope to see you again! Fantastic location with beautiful views, not too far from civilisation but very peaceful. Lovely cottage, clean, comfortable, warm (we stayed in winter) and well equipped. Would highly recommend! Nice tidy place in a great location. The cottage has a folder of info detailing the locals' secret spots, river swims, bush walks, hikes as well as favourite cafes, restuarants, pubs and winerys. There is so much on offer for all ages and interests!